If you can get your hands on a new Toshiba TV you might soon be able to talk to it using Alexa, as announced by the company at Berlin’s IFA conference today. At IFA 2018 Toshiba announced that, starting in 2019, the majority of Toshiba OLED, 4K HDR, and Full HD smart ranges will have Amazon’s voice assistant built in, giving users access to a variety of voice features. Instead of relying on a voice-activated remote control or the Amazon Echo, the new TVs will have an inbuilt far-field microphone, meaning you can ask your TV directly to turn the volume up, change the channel, or switch inputs. If you always forget to order new batteries for your remote control, you may also find Toshiba’s Amazon Dash integration useful. Customers with compatible TVs will have the ability to automatically reorder remote control batteries from Amazon when low battery levels are detected. Integration with Amazon Dash and Alexa forms part of Toshiba’s new ‘Smart Lounge’ experience, in which they aim to make the television the “forefront of home entertainment”. Toshiba also announced the launch of its thinnest ever TV - at just 2.5mm thick, the Wall Art model is designed to sit completely flush against the wall, creating a window-like effect with its 65 inch screen. The Wall Art TV is not only designed for entertainment; it’s also meant to function as art for your lounge. With powerful 4K HDR, it should provide exceptionally clear images, color, and contrast - and when the TV is not in use, its ultra-thin design allows it to blend into your home decor seamlessly. 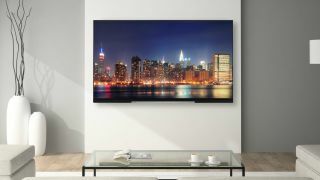 Toshiba has been able to make this model so thin by removing any of what they call “distracting hardware”, which means the TV relies on a separate sound box for audio, which connects via a “discrete” cable. Aside from the Wall Art TV, Toshiba has also announced a new 65” inch bezel-less model, removing intrusive borders with a tiny 4mm frame. The new TV is also able to boost picture quality in real-time, using Toshiba’s ‘Micro Dimming’ feature, which analyzes every TV frame as it plays, adjusting the light and dark areas of the picture for a more lifelike image. As well as Micro Dimming, the bezel-less model is Dolby Vision-enabled, promising cinematic viewing in your home.